Never thought I would do a post about motorsports. Some people are thrill about "man and machine". Even though I am a guy, motorsports are not something I prefer. But I grabbed the article featured below just to see why ICR wrote about Formula One (or, F1) racing, and I was pleasantly surprised. It's not so much about the sport as it is about the driver. I hope you will stay along for the ride (heh!) and maybe learn a few things like I did. The racing sport that seems to be the one most people hear about is NASCAR, but I reckon that it's on the wane. There are several auto racing sports in which well-heeled folks participate, and have some similarities. Those racing sports are popular, too. Here we'll focus on Formula One. Don't commence to thinking you'll be like one of the good ol' boys and use your own car in a Grand Prix race. That'll be the day! F1 autos are mighty expensive. Let me take a side trail for a moment. Having done some bicycling, I know that there are many things of which a rider needs to be mindful. How the bike feels, its sounds, traffic (not just vehicular), weather, how the rider feels, proper equipment, handlebar and saddle adjustments, and much more. The mind is processing a great deal of input very quickly. The whole situation is intensified during a race. There are similarities to what I just described to F1 racing. You may be tempted to think that anyone can get into an expensive car and go at high speeds around a track, but there are significant physical requirements. Making a turn, the driver may have to deal with five "gs" (g-force, the number of times the force of gravity; their effective body weight is five times greater). Astronauts on lift-off typically deal with three gs. 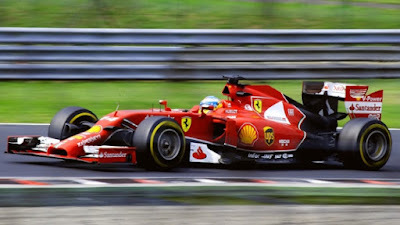 The input for an F1 driver includes radio communications, as well as the feel of the track, the automobile, sounds (very loud), and much more. Then there's the challenge of keeping it under control when something unexpected happens. The vehicles are carefully engineered by people using the minds the Master Engineer gave them. Doing the driving requires use of the engineered mind under stressful conditions and making rapid decisions. The brain is similar to a computer, but on a scale beyond the digital computer. More like a quantum computer! And we're supposed to believe all this came about by time, chance, natural selection, mutations, and luck? Oh, please. Bright red with perfect details, a Ferrari Formula 1 F1 SF15-T diecast model race car would make a great present! Young boys around the world push their model Ferraris across the floor while making sounds of growling engines and squealing tires. They envision themselves seated behind the wheel, racing on winding tracks and reaching speeds over 200 miles per hour. A select few will become race drivers. Along the way they will be physically transformed into something they probably haven’t considered: a world-class competitive athlete. Watching a Formula 1 (F1) car maneuver at high speeds is exciting. Seated in one during its performance is a different story altogether. Even riding as a passenger in dual-seated racing vehicles provides a whole set of sensations—mostly quite uncomfortable—that must be experienced to be appreciated. They are so unlike average driving that a realistic experience in one of these machines can’t be imagined. The physical strains demand that the drivers be in excellent physical shape. I'd be much obliged if you'd read the rest, just click on "Beauty in Motion: Formula 1 Drivers".